One outlier is the 2013 twin-turbo Nissan GT-R. The base price is expected to be about $92,500 once Nissan finally discloses it, and there are few options. In 2012, the GT-R extras were Super Silver paint, a backup camera, and logo-embroidered floor mats. That’s it. (We had none of those options on our car.) The ’13s, which have improved shift feel, the factory claims, plus the 15 extra horses, aren’t likely to be much different. The Nissan GT-R is a heavy car. In 2013, its a heavy car. Heavy cars put big taxes on the brakes and tires. They are both wear items. Eventually on track, the brakes show some weaknesses. 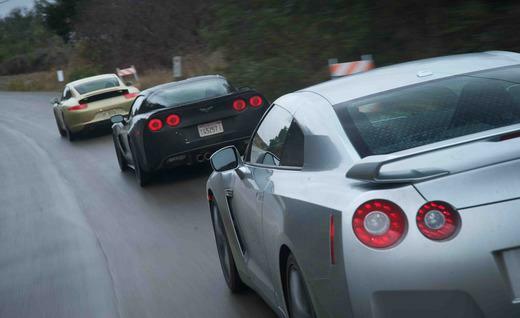 The brakes on the Nissan GT-R have some room for improvement. All-wheel drive has a couple of downsides besides the extra weight and fuel penalty (this was the test guzzler at 14 mpg). Namely, it produces understeer and dulls some feedback—though less than before—through the wheel. Despite having an extra 650 pounds to decelerate, this is the only car here without carbon-ceramic rotors. The brakes softened noticeably after a few hard laps. Head over to the magazine article for the full results.